Stops rust and corrosion just like the cups when placed in small spaces. Protect your tool box, fishing tackle box, electronic equipment, jewelry, coins and silver from corrosion and tarnish. 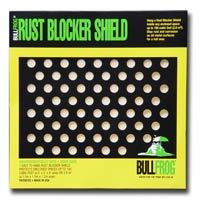 Stop rust for a year in any enclosed space up to 5 cubic feet. Use in tool chests, gun cabinets and electronic cabinets. 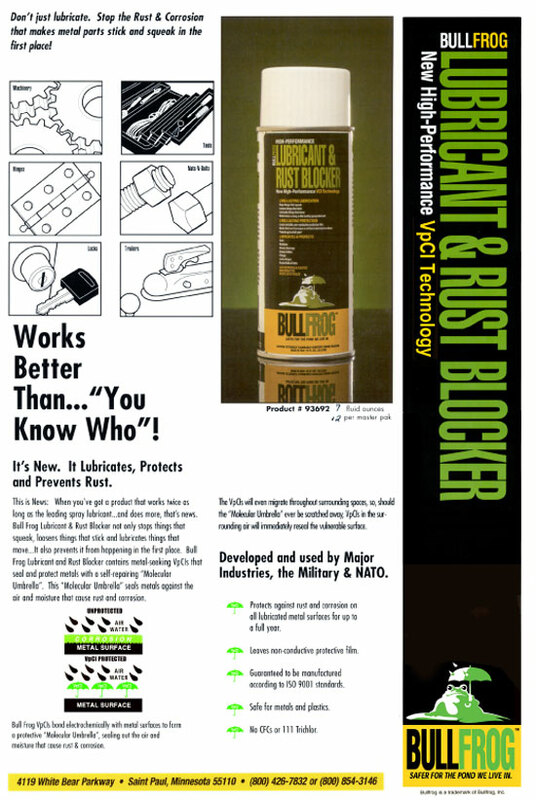 Used by the worldÕs largest companies to protect their critical assets from rust and corrosion. Protect larger enclosed spaces from rust and corrosion. Hang it in a gun safe, storage locker, trunks, closets or engine compartments. Hang it up in a second and relax for a year. 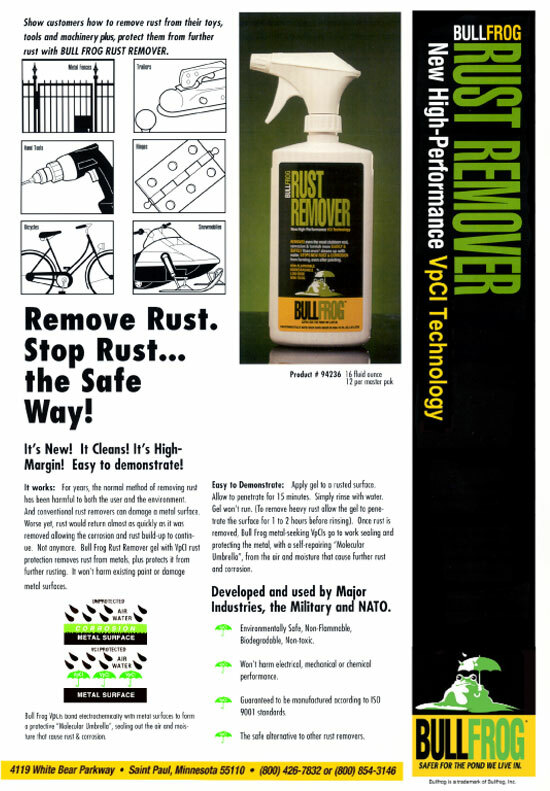 Finally, a Rust Remover that is safe to use and safe for the environment and it really works! Cleans up with water . . . plus, VpCIs protect the metals from flash rusting . . . tools, cars, trucks, RVs, farm equipment, bikes, metal furniture, garden equipment. 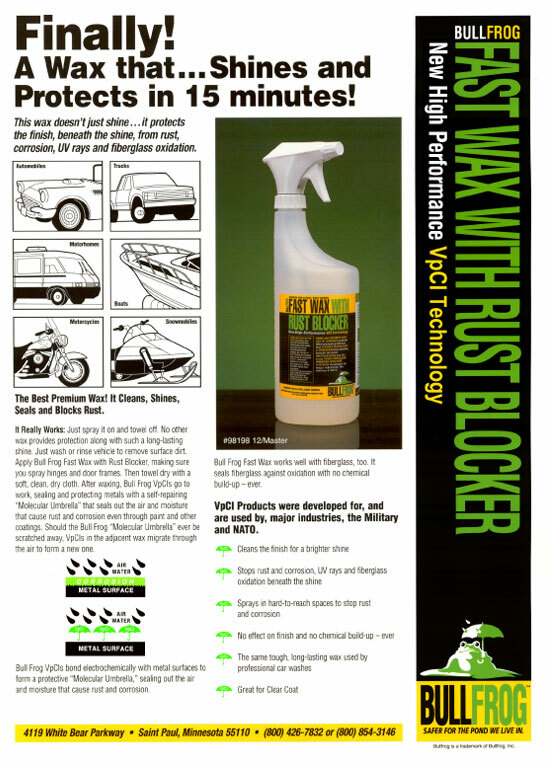 Prevents rust before it starts. Sprayed on, it forms an invisible ÒVpCI Molecular UmbrellaÓ that seals exposed metal surfaces against rust such as latches, hinges, trailers, farm equipment, outdoor furniture, garden equipment and fences. The hardest working cleaner/degreaser you can get, plus VpCIs protect metal surfaces from flash rust and corrosion. Biodegradable and phosphate free . . . engine, parts, motorcycles, farm equipment, power tools, hand tools, garden equipment and grills. The one step paste wax that is the hardest working and brightest shining paste wax on the market. VpCIs will seal and protect the metal surfaces from corrosion. Protects against UV rays and fiberglass oxidation and is great for clear coat finishes . . . cars, trucks, RVs, motorcycles and boats. Shine and protect your vehicle in just minutes. 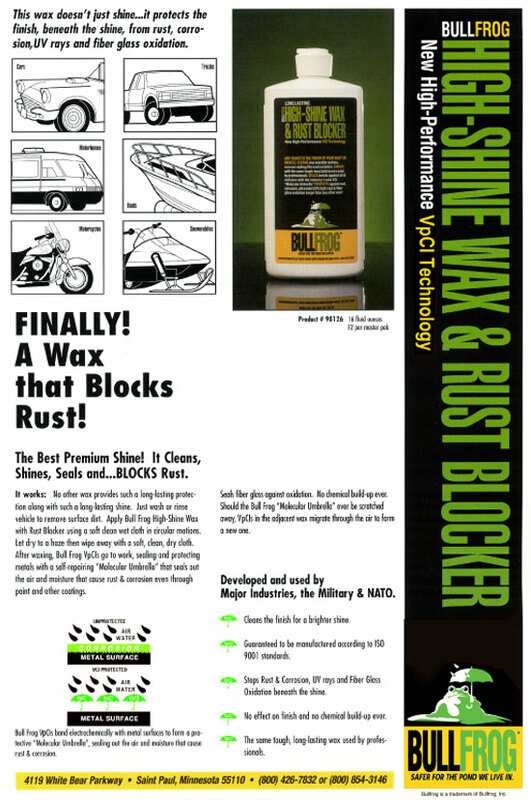 The easiest and fastest wax available and the only spray wax that actively blocks rust and corrosion . . . cars, trucks, boats, RVs, even appliances. When applied on rusty or poorly prepared metal surfaces, Rustorer quickly penetrates to bare metal to prevent further corrosion. 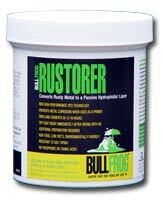 Rustorer quickly converts existing rust in to a passive hydrophobic layer, which can be used as a primer before top coating. Excellent for severe exposure conditions and exposures to seawater. Remove the dirt, grit and corrosion that is silently attacking the performance and reliability of every electronic device, every electrical system that you own! Preferred by the U.S. Navy and repair technicians around the world . . . electrical connections, cars, trailers, equipment, outdoor lights, phones, remotes, TVs, VCRs, even light bulbs. 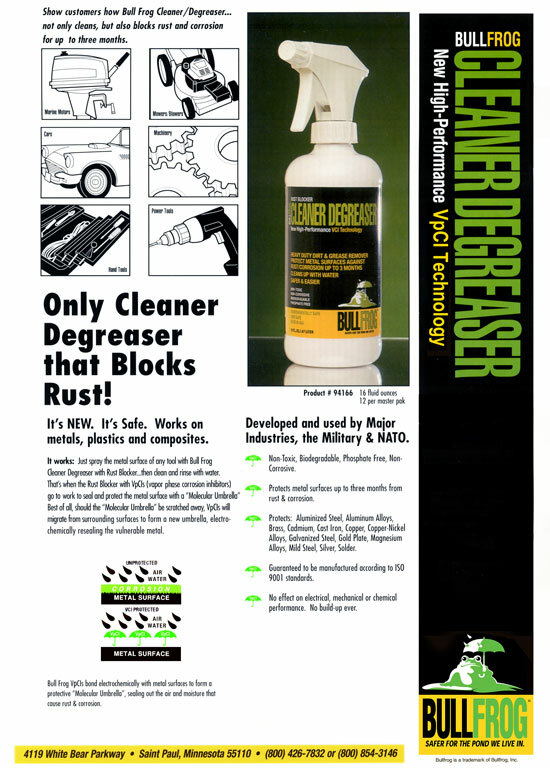 Rusthunter Firearm Cleaner and Rust Blocker cleans, lubricates and protects. The absolute "Gun Care" Choice for removing powder residue, dirt and grime. Excellent for displacing moisture while leaving a barrier that protects against corrosion for up to one year. Fast drying action won't attract dust and dirt. Maximize the appearance and performance of your firearms with Rusthunter. Not only stops everything from squeaking and sticking, but also prevents it from happening in the first place. Protects against rust and corrosion for up to a full year. No CFCs or 111 Trichlor . . . machinery, hinges, equipment, locks, hedge clippers, tools, nuts/bolts, any moving part. 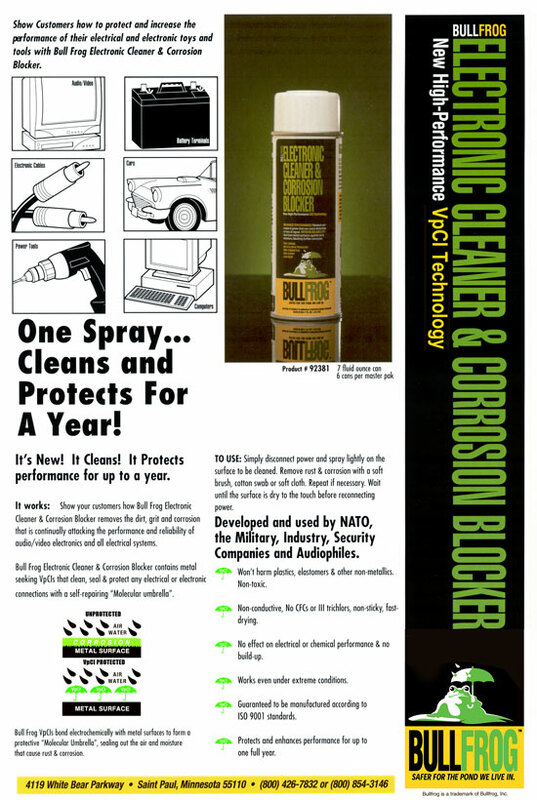 Bullfrog Tool Wipe is a revolutionary wipe which removes surface rust, grease, oil, and grime. 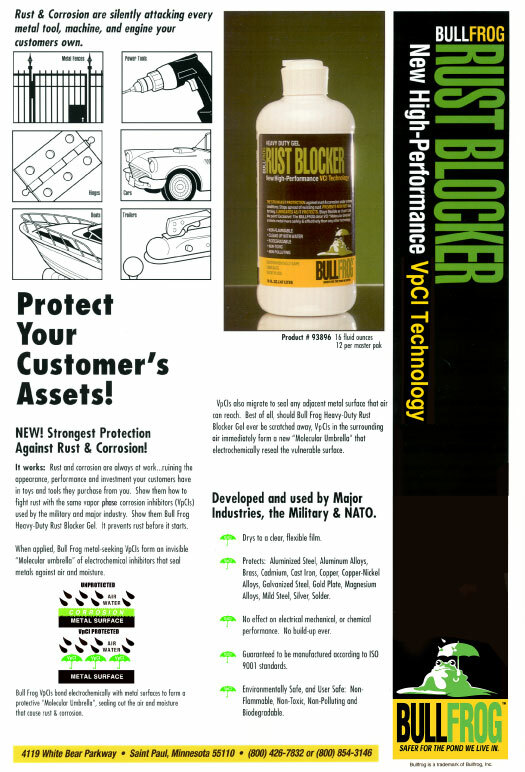 Cleans and protects while leaving behind a long lasting VpCI protective barrier. Perfect for tools, machinery, parts or any metal surface. Our same great Rusthunter is now available in a ready to use gun wipe. 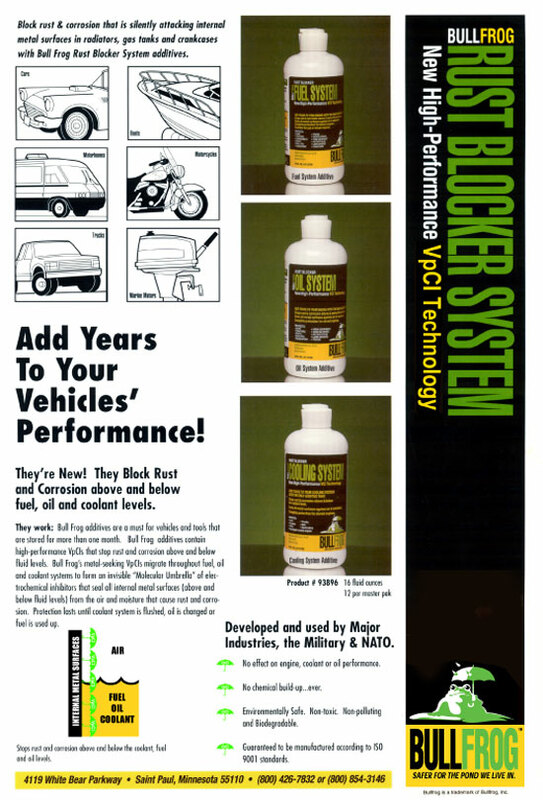 Cleans and protects while leaving a long lasting protective barrier. The ultimate "Gun Care Companion" to take with you on your next hunting adventure or trip to the range. Bullfrog metal-seeking VpCIs seal and protect metals with a self-repairing "molecular umbrella." The VpCIs migrate throughout crankcase oil, forming an invisible molecular umbrella of electrochemical inhibitors that seals internal metal surfaces against the air and moisture that cause rust & corrosion both above and below the oil level. There's no effect on engine or oil performance, and no chemical build-up - ever. Protection lasts until oil is changed. Bullfrog metal-seeking VpCIs seal and protect metals with a self-repairing "molecular umbrella." The VpCIs migrate throughout liquid cooling systems, forming an invisible molecular umbrella of electrochemical inhibitors that seals all internal metal surfaces against the air and moisture that cause rust & corrosion both above and below the coolant level. There's no effect on cooling system performance, and no chemical build-up - ever. Protection lasts until cooling system is flushed. Bullfrog metal-seeking VpCIs seal and protect metals with a self-repairing "molecular umbrella." The VpCIs migrate throughout fuel and adjacent air spaces, forming an invisible molecular umbrella of electrochemical inhibitors that seals internal metal surfaces against the air and moisture that cause rust & corrosion. There's no effect on engine performance; no chemical build-up; and no more rusty sludge in your fuel tank to clog your fuel filter. Conventional gun cases only protect firearms from dust. 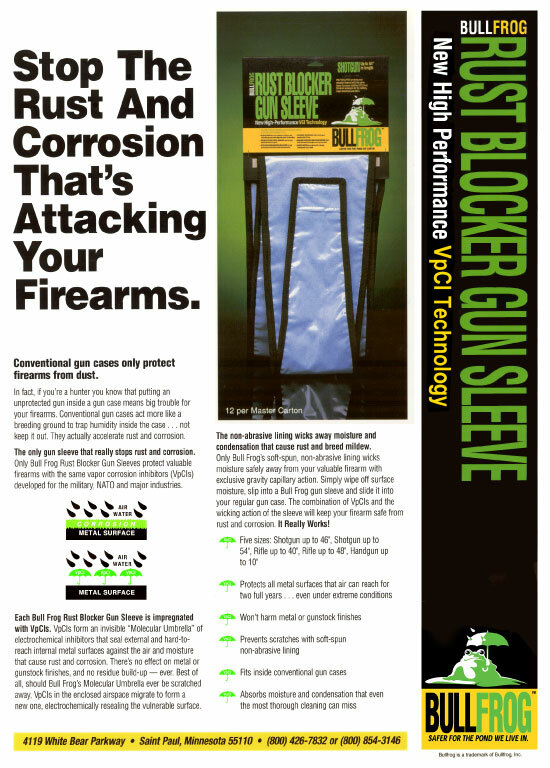 Only Bullfrog Rust Blocker Gun Sleeves protect valuable firearms with the same vapor phase corrosion inhibitors (VpCI®s) developed for the military, NATO, and major industries. Bullfrog's soft-spun, non-abrasive lining wicks moisture safely away from your valuable firearm with exclusive gravity capillary action. A canvas or vinyl motorcycle cover will not protect a stored motorcycle from the rust and corrosion that will impair its look and performance. 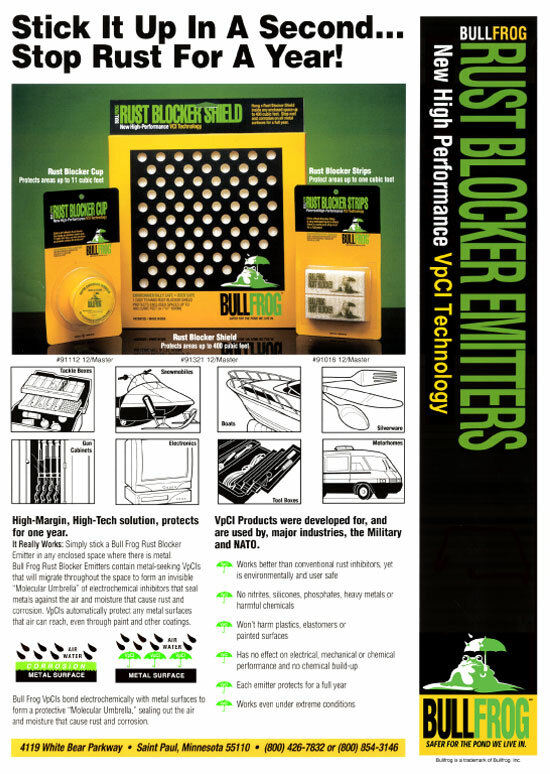 Only Bullfrog motorcycle covers with Rust Blocker protect your bike with the same vapor phase corrosion inhibitor (VpCI) used for transit protection by major motorcycle manufacturers. Made of a 3 layer material, the cover is waterproof on the outside, abrasion proof on the inside, and its one way breathable action allows the cover to move moisture away from your machine.